Designed to match our solid cherry raised panel sleigh bed, the #510 sleigh style nightstand features the fine Amish craftsmanship that Clayborne’s customers have come to expect. Built from the finest hardwoods, it features three drawers for plenty of storage, and is available in two different size options to accommodate a variety of bedroom layouts. 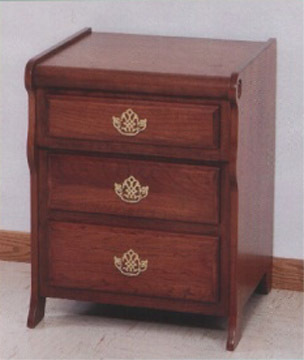 This night stand is also a perfect match for the sleigh style lingerie chest, regular chest, and chest on chest that are also part of this collection.